Christmas is the season of peace and goodwill until you go shopping and get the bill! 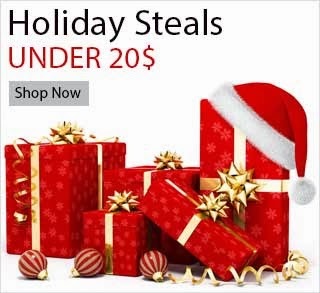 But with our special list of Holiday steals under 20$, you’ll make everyone happy without spending a fortune. Chocolates & Cookies : Yummy baked cookies and delicious holiday chocolates ! Nothing can be a better gift than this for Christmas. Cookies of santa claus and Christmas tree shape can be gifted to the kids and delicious liquor and rum chocolates make a splash among the adults during the festive season. So take a sigh of relief and view the best online deals for Christmas gifting .